In theory, whole islands of antimatter could be floating in the universe, cut off from matter by the empty void of space. If a large chunk of antimatter fell to Earth, the planet would be vaporized in a blinding flash of energy. 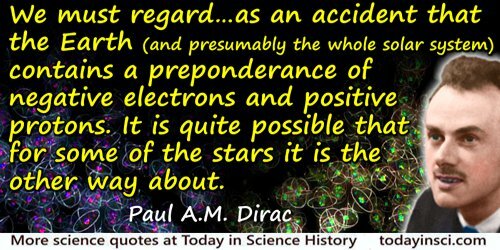 We must regard it rather as an accident that the Earth (and presumably the whole solar system) contains a preponderance of negative electrons and positive protons. It is quite possible that for some of the stars it is the other way about.